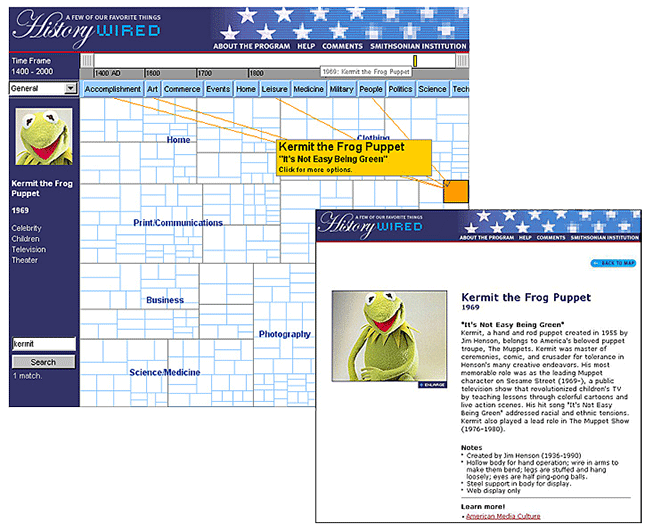 HistoryWired: A Few of our Favorite Things was an experimental website launched in 2001. Designed to let users explore a sampling of the Museum’s collection, the site featured 450 objects—famous, unusual, and everyday—with interesting stories to tell. No longer compatible with current Web standards, the site was retired in August 2016. HistoryWired employed a unique interface developed by Martin Wattenberg at SmartMoney, Inc., and was based on SmartMoney's Map of the Market. The data visualization derived from work on treemap displays conducted by Prof. Ben Shneiderman and students at the University of Maryland Human-Computer Interaction Lab. The collection “map” was designed to help visitors find objects that interest them. The map face had ten categories that represented different types of objects in the collections. Each individual block on the map face represented an object, and the relative size of the block reflected the degree of interest expressed by previous visitors to the site. The map could be customized using timeline sliders, theme buttons, the text search, or any combination of the features. HistoryWired was awarded a Silver Muse Award from the American Association of Museums. It was featured in the New York Times, the Washington Post, USA Today, and other media outlets. HistoryWired was the Museum’s first effort to provide a way for online visitors to search and explore a sampling of our collection. A more standard database search was added in 2005. Today, our collections search provides access to hundreds of thousands of digital records documenting artifacts and archival materials held by the Museum.